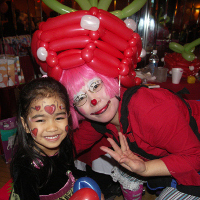 For a wonderful way to have an unforgettable birthday party, hire clowns in NY for your next event! Both kids and adults will enjoy laughing at the antics of New York clowns. Many payasos en New York are also bilingual, so hire them for your Spanish and English speaking children! View even more clowns for hire in NY at KidsParties.Party, the ulimate kids birthday guide. These funny children's entertainers will bring excitement to your party. A clown the whole family will love! 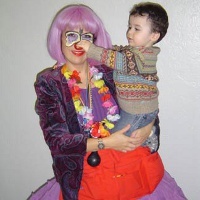 Looking to give your child an uproariously funny birthday party with colorful Clown-Magic, but no scary clown make-up? 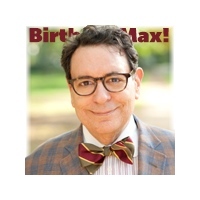 Then look no further than Birthday Max! Your guests will be swept up in Birthday Max's whirlwind of vaudeville-style comedy bits & comedy-magic. Birthday Max brings the “funny” with his "Balloon Hysteria” and "Juggling Workshop,” everywhere within the New York area. Parents and children alike shake with laughter as this experienced professional provides an unforgettable visit that's 100% rock-solid fall-on-the-floor-funny (a technical term, meaning “Maximum Funny"). Take your child's birthday party "to the Max!" Birthday Max rocks the entire New York area! Call for pricing and a free consult today! Best Clowns in the industry! Clowns.com is one's one-stop shop for all things clowns for your next New York party. 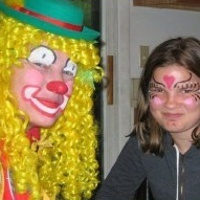 Clowns are a great way to make any party unforgettable. Our professional kids entertainers in New York are professional and pride themselves on entertaining your party guests. Both kids and adults alike will enjoy the entertainment of a party clown. Clowns.com offers a variety of party packages including costume characters, princesses, inflatable rentals and more. Our New York party experts can help you create a party that will entertain the most. Call our award-winning support at 516-517-0000 today. As seen on TV!!! 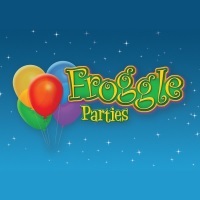 Froggle Parties provide high energy kids parties that pack a ton of fun!!! Covering the whole of New York, Westchester, Staten Island, Brooklyn, Queens, Bronx, Long Island, and beyond! We offer a truly awesome range of kid’s party clowns, hilarious entertainers, brilliant magicians, costumed characters, face painters, super discos, bubble parties, balloon twisters and more. All our incredible kid’s parties are jam-packed with hugely entertaining activities your children will love!! Watch as our Froggle party performers have you kids mesmerized from start to finish! Our amazing children’s party entertainment is completely unique to Froggle. We recruit and train our team of entertainers to do our own shows that are completely exclusive to us! For truly memorable parties it must be FROGGLE PARTIES!!!! Serving the whole New York area! One of the Top Cute Clowns in NY! This vibrant and energetic clown is sure to bring life and laughs to your next party! Unlike many other clowns, Summer does not use whiteface makeup - she keeps her makeup light so that even small children will enjoy playing with her and will not be frightened. Summer always wears a stylish balloon hat and is happy to make hats for children at the parties she goes to. Having entertained a wide range of audiences including BK Fashion Week, many preschools and day cares, and hundreds of parties this New York clown is a consummate professional. Summer is bilingual, she is both an English and Japanese speaking clown in NY. A Diverse Group of NY Clowns! This group of clown entertainers in NY are the perfect people to contact when you are looking for entertainment for your next kids party. With a wide range of clowns from which to choose including Spanish speaking clowns, stilt walkers, mimes, balloon twisters, ventriloquists and more. Crazy Daisy's clowns can also bring a costumed character with them such as Snow White or Cinderella, and can bring cotton candy or popcorn for your kids. 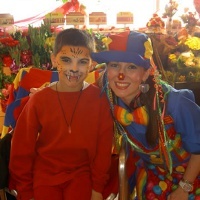 If you are looking for something to bring extra excitement to your child's party, contact Crazy Daisy's Clowns! Many packages to choose from! Kids Entertainment offers a variety of entertainment for your special events. A party clown in New York will make any experience that much more memorable. Our professional clowns are friendly and professional. They want to make sure that every party guest has a great time. Kids Entertainment also offers many party packages that are customizable for each event. Contact our party planning experts today at 516-900-2678 to begin planning your next party. These Clowns are Consummate Entertainers! This diverse group of clowns has been entertaining the public for over 13 years with their humor and talent. 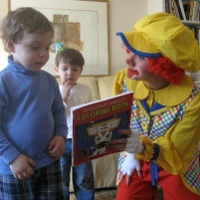 Whatever kind of entertainment you'd like for your child's party it will be improved by having a New York clown do it! Face painting, temporary tattoos, sand art, balloon sculpting, dancing, comedy, magic and much more can all be brought to you by clowns from the Speedo the Clown Agency. When you book a clown from this agency, they will ensure that you get the best clown for your specific event, no matter what setting or age group. You'll never forget hiring a clown! Dance, Play and Laugh with this Fun Clown! If you are looking for a bright and fun clown for your next kids party, communion, christening or other event, call up Sunny! She is a children's entertainer who has been bringing smiles to faces for more than a decade. Having received rave reviews, many awards and even having been featured on the front page of the New York Post, this clown is an accomplished entertainer. 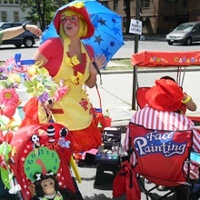 Sunny will delight your children with her displays of balloon twisting and puppets. She'll bring a whole lot of laughter to your party with her fun antics and great games. Don't miss out on the fun - call Sunny today! Offering her talents in face painting, magic and comedy to people of all ages for over 25 years Apryl Cadabra is a consummate clown. She is a must-have at your next kids party if you want to make a lasting impression and keep your guests giggling. Not just for kids parties, Apryl Cadabra and her team can entertain people of all ages at many kinds of events - her comedy routine will have you laughing out loud. Apryl loves sharing the gift of humor with all people and regulalry offers healing laughter at NY hospitals, bringing smiles to the faces of ill children. This fun clown in NY is also a Spanish speaking clown! Great Balloon Twisting Clown Duo! This mother-son duo have been entertaining audiences for over 20 years. The perfect pair to hire for your next birthday party, they keep kids giggling with their hilarious antics, fascinating magic, amazing balloon twisting and fun face painting. Priding themselves on having children's entertainment with a positive message, these party clowns NY love making kids laugh. MisMatch and YooHoo have extensive experience entertaining at store openings, restaurants, libraries, schools and private parties. 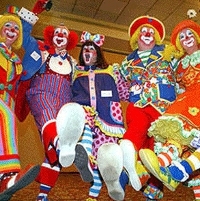 Think of these clowns when you are planning your next kids event! 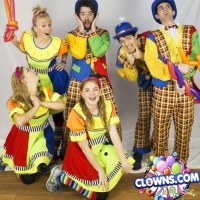 Kuddles the Clown and her team of hilarious entertainers are available to liven up your children's birthday party or event with their special skills like glitter painting and balloon twisting, and their unforgettable costumes. 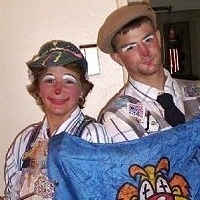 For over a decade these lovable clowns have been making both children and adults smile with their crazy antics. Experienced at entertaining in all sorts of venues such as store openings, schools, restaurants and parties, these professional clowns will make your event a hit! Kuddles and her team can even throw the whole party for you when you book one of the party packages offered such as the Rockstar Theme Party, the Stuff-A-Bear Party or the Princess Party. Throw a Successful Party with this Entertainer! This consummate performer has been entertaining audiences of all types for years. His stunning magic tricks, juggling and balloon sculpting are unforgettable when you have him at your next party. Kids love Mickey Sharkey's jovial attitude and he'll have them laughing in no time. With shows that are great for all ages, Mickey Sharkey can adapt his entertainment for anything from a toddler party to a corporate event. His magic shows include a lot of audience participation so even the shyest child will have fun. This talented and hilarious group of entertainers will keep the guests at your next children's party giggling throughout. Bernie's clowns can do magic, twist balloons, paint faces and play games. They always have lots of audience participation so every child will be engaged. The slapstick humor and funny jokes of Bernie's clowns will make your party unforgettable! In addition to clown party entertainment this great group can do specialty acts, host princess parties, offer DJ/MC services and entertain at holiday parties. 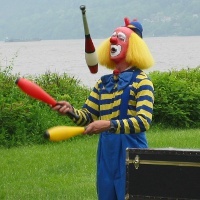 Macaroni the Clown, one of the most sidesplitting clowns in NY, is a consummate performer and one of the top choices for entertaining at your next children's birthday party. 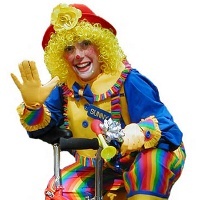 Macaroni can juggle, ride a unicycle, twist balloons, walk on stilts and do many more entertaining and funny things. 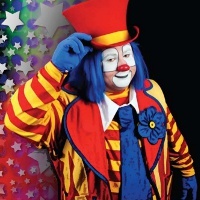 Macaroni graduated from the Ringling Brothers Clown College and is a member of the World Clown Association. With his 30 years of experience he is uniquely qualified to keep your guests with smiles on their faces. This New York Clown has Entertained Internationally! 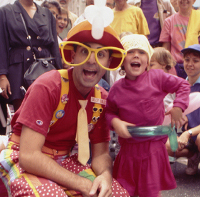 Silly Billy the clown has been entertaining audiences of all ages for over 15 years. He is a perfect main event for your children's party as he can juggle, do magic, face paint and tell hilarious jokes that will keep both kids and adults in stitches. He has not only entertained but also has taught and mentored other children's entertainers how to reach their audiences with humor and joy. He has appeared on various television shows and channels including Comedy Central and MTV. With over 8,000 performances throughout his career, Silly Billy truly knows what makes people laugh. Clowns, Costumed Characters, Games and Fun! Jubilee and her group of clowns can entertain at your next kids party and have the children smiling and giggling the whole time! Their goal is to provide your child and his or her guests with an unforgettably fun time at the party. They accomplish this through games, face painting, singing, balloon twisting and more! If you'd like a costumed character or princess to accompany your party clown in NY just ask! Jubilee and her clowns have entertainment packages for kids parties all the way up to 14 years old. Also, these New York clowns hablamos Español! This party entertainment company has professional and experienced clowns to bring joy and laughter to your next birthday party. 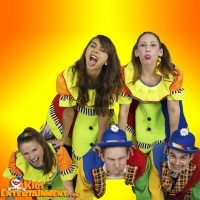 All of Just Kidz Fun's clowns have several years party entertaining experience and many of them have won awards in clowning excellence. Hire one of these great clowns to bring laughter to your party with games, magic tricks, juggling, face painting and more! Just Kidz Fun also can send you magicians or costumed characters to entertain the children at your party. Whether you are throwing a small birthday party or a large bar/bat mitzvah these entertainers won't disappoint! 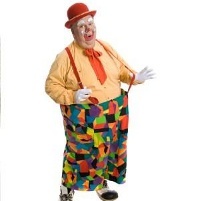 This wonderful clown brings fun antics and goofy jokes to your party to keep your kids laughing from start to finish. Whoopsy Daisy has been entertaining throughout the Hudson Valley region for over 10 years and always leaves her audiences wanting more. Whoopsy Daisy has not only had extensive training from some of the best clowns around, but she is a member of several clown organizations including World Clown Association and Clowns of America International. As one of the most hilarious party clowns New York has to offer, Whoopsy Daisy is a great choice for your next kids birthday party! These great party entertainers will make sure your child's birthday party or event is a hilarious time that nobody will ever forget! Hire friendly Banjo the Clown to entertain your children with songs on the Banjo, facepainting, games and balloon twisting. Or choose Sassi the clown or one of the other engaging and fun performers from among Sassi's group of professional entertainers. This great entertainment company can provide princesses, fortune tellers and clowns for your child's party. Your children will be delighted with the unique and riveting entertainment provided through storytelling, game playing, magic and more.